A high school drama and comedy, The Edge Of Seventeen deftly delves into the world of teenagers where every emotion and setback is heightened. Seventeen year old high school student Nadine (Hailee Steinfeld) announces to her laid back teacher Mr. Bruner (Woody Harrelson) she is about to kill herself. In flashback, Nadine is revealed to have been an introverted child, while her older brother Darian was easygoing and popular. Nadine suffered a shock when she lost her father early in life, and never got along with her self-obsessed mother Mona (Kyra Sedgwick). But in elementary school she finally found happiness through a long-lasting friendship with classmate Krista. Now in high school, Nadine still finds it difficult to fit in, and her one true friendship is severely tested when Krista (Haley Lu Richardson) and the hunky Darian (Blake Jenner) start a relationship. Nadine has a crush on cool kid Nick (Alexander Calvert), who probably does not know she exists. 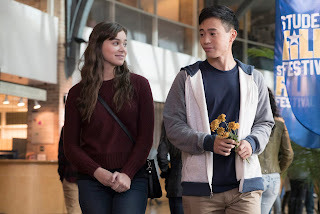 Classmate Erwin (Hayden Szeto) appears interested in Nadine, but is equally awkward and tentative. With Mona's insensitivity amplifying a really bad week, the world seems to close in on Nadine. Written and directed by Kelly Fremon Craig and co-produced by James L. Brooks, The Edge Of Seventeen breathes fresh life into teen coming-of-age high school film. More drama than comedy, Fremon Craig strides into serious terrain for young adults, where friendships are sacrosanct, crises escalate in a hurry and viable options appear limited in the heat generated by raging hormones. The film is light on its feet despite the weighty subject matter. Fremon Craig is able to represent and emphasize with her characters while still poking gentle fun at the hypersensitive teen world. The scenes are brisk, the dialogue sharp and bright, and the film avoids melodrama even when Nadine's world is at its darkest. A stripped down Hailee Steinfeld effortlessly carries the film on her shoulders, playing Nadine as a teen overwhelmed by living in her brother's long shadow, still missing her father, feeling invisible when it comes to the dishy boys, and confounded by an egocentric mother (with Kyra Sedgwick delivering some career-best work). Nadine perceives Krista's relationship with Darian as the worst kind of betrayal, triggering a rapid downward spiral towards self-inflicted humiliation and despair. To soften the often somber tone, The Edge Of Seventeen does seek out moments of wit and humour, and most of these are delivered courtesy of Mr. Bruner. In a performance so intentionally lackadaisical he often threatens to disappear into his teacher's chair, Woody Harrelson as Bruner offers a counterpoint to all of Nadine's angst, at once comforting and exasperating. Without ever lecturing or hectoring, Bruner absorbs Nadine's turmoil and nonchalantly nudges her towards exploring a new thought stream. Nadine will have to find her own way out of the doldrums. The Edge Of Seventeen exposes the seemingly crushing pressures of growing up and fitting in, and the teenager's extraordinary resiliency and capacity to cope and finally unravel the puzzle of growing up.